The e-mail is a fast and important means of communication. Person A can contact Person B across the ocean using the Internet. E-mail is the most common form of communication on the Internet. It is coded and un-coded as it traverses the distance and goes through the process which is illustrated below. Alice at alice@a.org sends an e-mail to Bob at bob@b.org. 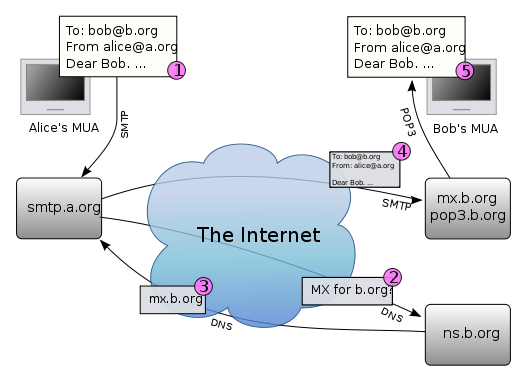 To get there, the e-mail first goes through a the Submission Protocol (smpt.a.org) which sends it to the Domain Name System for domain name verification, which sends it back to the Submission Protocol, which gives it to the Message Transfer Agent (mx.b.org) which gives it to Bob. That is the process of the e-mail. Programming languages are languages that convert information given by the person using the computer into complex instructions that the computer uses to carry out tasks efficiently. Thousands of languages have been developed over time. Nowadays technology is such that we can create programming languages that would not have been possible thirty years ago. Human languages are both denotative and connotative, which means that they are not precise. Computer languages are denotative only, which makes them more precise. There are low-level and high-level languages. High-level languages are easiest for humans to understand and write. They are abstract. High-level languages are translated into machine code though software programs called interpreters or compilers. Low-level languages are difficult for humans to understand. They are not abstract. No interpreters are needed for low-level languages. Programming languages are very complicated to learn. They take many years to master. They have existed for over fifty years. They allow us to do things on the computer which we would not be able to do without them. Urban Search and Rescue (Urban SAR), the Mountain Rescue Association, and the Coast Guard are only a few of the many SAR fields. Urban SAR was founded, and is conducted, by FEMA (Federal Emergency Management Agency). This system uses a number of teams for different functions, such as medicine, safety, etc. One of these uses canines (K-9). These latter can have a basic certificate, in which the handler gives commands to the dog, and the dog obeys. There is also an advanced certificate in which the dog can work on complex activities without the handler. There is also a Rescue team, who does as the name suggests. The Hazmet (hazards) team looks over every situation and observes and eliminates any hazards to the people and SAR members. They can collapse threatening buildings, or other threatening objects, natural of artificial. Medical teams are always on hand for delivering First Aid, and the Logistics team works side by side with them. And last but not least, there is the Plans team, the structural engineers. Urban SAR is on hand 24-7 due to the shifting of two parties every twelve hours. The teams can also be at any disaster site within twenty-four hours. SAR members can rescue trapped victims from fire, collapsed building, collapsed mines, trenches, etc. SAR members also work in very hazardous situations, such as earthquakes, hurricanes, typhoons, storms, tornadoes, technical failures, technological accidents, terrorist activities and hazardous material releases. These compose only a few of the extremely dangerous situations in which they place themselves for the sake of others. Mountain Rescue Association was established in 1959, making it the oldest SAR group in the USA. They help avalanche victims; they educate people about the ways of the mountains, avalanches, rock-slides, etc. They help climbers and hikers, and they help people develop plans and safety procedures. The Coast Guard is responsible for all maritime SAR activities. They typically use helicopters, but sometimes boats are needed. They go to the aid of divers and ships, and they can retrieve objects that are accidentally dropped into the ocean. They are the SAR unit to call to for help on the ocean. These SAR teams help save human lives at the expense of their own. They are highly trained and skilled workers, and many times our lives are in their hands. Remember Search and Rescue! Galaxies are massive groups of stars and gas that are spread throughout the universe. Our solar system is located within the Milky Way galaxy. We can only see a part of the Milky Way galaxy, because it is huge. It would take millions of light years to cross it. Galaxies were known, but they were thought to be small, until Edwin Hubble discovered that galaxies were giant in 1924. There are different types of galaxies. There are Spiral, Barred Spiral, Elliptical and Irregular galaxies. Spiral galaxies are divided into three categories: A,B and C. A spiral galaxies have many flat, tucked arms. B galaxies have fewer arms, but they are still tucked. C galaxies have a small amount of loose, un-tucked arms. Barred Spiral galaxies are essentially the same as the Spiral galaxies, with the same categories, but they have a bar in the middle instead of a circle. Elliptical galaxies range from round, with no arms, to oval, with no arms. Irregular galaxies are all shapes and sizes, and are made up of mostly gas and dust. Galaxies are gathered into clusters. Clusters are massive groups of galaxies. Super-clusters are clusters of galaxy groups, and sheets are gigantically massive clusters of super-clusters. It would take at least a billion light years to cross. Galaxies are giant spheres of light which slowly move across the unlimited universe. To know all of them, we would have to travel infinitely across the universe.